manage board members, staff, and volunteers. Whether you are dreaming of starting a nonprofit or are already in the trenches, Starting and Building a Nonprofit will help your organization make a real difference in the world. The fully updated eighth edition includes the latest information on building audience and promoting your mission on social media. Are you a California resident? Check out How to Form a Nonprofit Corporation in California. Do You Want Tax-Exempt Status? Should You Have Voting Members? Changing the world is not a one-person job. Of course, one person can make a difference: Committed, motivated individuals are often the seeds of major social movements or the subjects of inspiring stories about how ordinary people, through passion and tireless dedication, can move mountains for a worthy cause. But there is strength in numbers, and those who want to bring about change are most likely to succeed when they come together with like-minded comrades to work toward a common goal. Nonprofit organizations exist to bring together the people and resources necessary to mount these noble efforts. If you’re considering trying to bring about change in your corner of the world by starting a nonprofit, this book will help you make your venture a success. Many people believe—mistakenly—that all nonprofits are underfunded labors of love, kept afloat by the scrappy and tireless efforts of self-sacrificing, long-haired activists. While this description probably fits more than a few nonprofits, there are also plenty of nonprofits that bring in millions of dollars each year, pay hefty salaries to their workers, have swanky corporate offices, and even impose dress codes. In between these extremes, there are scores of nonprofits with varying assets, diverse office cultures, and a wide array of political leanings. While the volunteer-driven model of nonprofits is alive and well, more and more nonprofits are adopting the entrepreneurial strategies and business models developed in the for-profit world. Many nonprofit managers and staff members have discovered that working for a nonprofit is a satisfying way to meet important community and societal needs and make a living at the same time, which can be more difficult in the for-profit arena. Whether you’re ­driven purely by a passion for your mission or you want to combine your activist aspirations with a solid career, starting and running a nonprofit can be a great way to achieve your goals. This book is intended for anyone who is considering starting a nonprofit or reorganizing an existing group. You may be working with a group in its embryonic stages and coming to realize that you need to organize more formally. (Often, a group’s lack of structure makes it ineligible for grants, unprepared to hire paid employees, or simply ineffective in its day-to-day operations.) Or, you may just have a goal or passion in mind and want to learn how to create an organization devoted to achieving that goal. You may be a budding founder of a new group or a staff member or volunteer at an existing group that needs an overhaul. No matter what position you hold or how far along you are in the process of bringing a group together, this book will help you understand the basics—and beyond—of nonprofit organization, planning, structures, management, marketing, and more. For the most part, this book assumes that the reader is a founder or board member of an existing or future nonprofit group. However, you may be an executive director, manager, staff member, or volunteer who is researching nonprofit management in order to create or improve your group. Where the information in this book is directed not at the board or founder but at the executive director or other manager, it is noted explicitly. The term “nonprofit” is often used loosely to ­describe all kinds of groups that are bound together by a desire to achieve a mission, rather than to make a profit. By itself, the term “nonprofit” does not indicate any specific type of legal structure. If a nonprofit group incorporates, it is a nonprofit corporation; if not, it is an unincorporated nonprofit association. For example, a group of people interested in keeping a local park litter free would likely be called a nonprofit, as would a group of soccer dads who sell candy bars to fund their children’s trips to soccer tournaments around the state. Both groups could be called nonprofits because both are mission driven, not profit driven—but they could have different legal structures. If the park group never did anything to create a formal structure, it would technically be considered an unincorporated nonprofit association. If the soccer dads filed incorporation papers with the state, the group would be a nonprofit corporation. Before getting into the details of starting and running a nonprofit, here’s a brief overview of the legal issues involving corporations in general, and nonprofit corporations in particular, and the various ways that running a nonprofit differs from running a for-profit business. To create any type of corporation, nonprofit or for profit, you must file paperwork with the state government—usually the secretary of state’s office. The document you must file with the state to create a corporation is typically called “articles of incorporation.” Once you file this document, you have “incorporated” and created a separate legal entity: your corporation. In the simplest terms, a corporation—­whether nonprofit or for profit—is a type of business structure. Other types of business structures include sole proprietorships, partnerships, and limited liability companies (LLCs). Some states also recognize associations: groups of individuals who work together for some common goal but haven’t taken steps to create a specific legal entity. The main differences between the various business structures lie in how they handle two important issues—personal liability and taxation. Some business structures (such as corporations) protect their owners from personal liability, while others (such as sole proprietorships) do not. If the business structure limits its owners’ personal liability, the owners’ personal assets will be protected if the business is sued or otherwise finds itself in debt. If the business structure does not limit its owners’ liability, the owners’ personal ­assets—such as houses, cars, bank accounts, and so on—can be taken to satisfy business debts or a lawsuit judgment. Many nonprofits choose to incorporate primarily to receive this liability protection. Nonprofit corporations are separate tax entities but have different—and more favorable—tax rules than for-profit corporations. A nonprofit corporation is an organization that has a mission to serve the public interest and has filed incorporation papers with the state. Because the corporation works for the public good, it receives exemptions from state and federal taxes it would otherwise have to pay—which means that these groups are, to a certain extent, publicly subsidized. The mission-driven nature of nonprofits sets them apart from traditional private businesses, but they’re not part of the government, either. (In fact, they are sometimes called nongovernmental organizations or NGOs.) Nonprofits occupy a unique position between the public and private worlds and share some characteristics of each. In exchange for being exempt from many of the taxes that normally apply to private businesses, nonprofits must dedicate themselves to the public interest and govern themselves according to certain rules designed to ensure accountability. To ensure that nonprofit corporations are, in fact, working for the public good—and earning their tax breaks—state laws require them to establish certain organizational structures. A nonprofit corporation must have a board of directors (sometimes called a board of trustees), which is responsible for keeping the organization on track, working toward its stated nonprofit mission. Other state rules impose legal duties on the board—for example, the duty to act with care and the duty to be loyal to the organization—and ensure that the board does not stand to gain personally from the nonprofit’s activities. The steps you must take to form a nonprofit corporation are similar to the procedures for starting a regular corporation, but a bit more involved. ­Starting a nonprofit corporation is something like getting a commercial driver’s license: The process for getting a commercial driver’s license is very similar to that for getting a regular driver’s license, and the same agency grants both licenses, but you must satisfy a few extra rules to gain the additional privileges and responsibilities that accompany the commercial driver’s license. Likewise, creating a nonprofit corporation is very similar to creating a for-profit corporation: To do either, you must apply to the same agency and follow a similar process—but to create a nonprofit corporation, you must satisfy a few extra rules. Some of you reading this may wonder whether it would make more sense to start a regular for-profit business instead of a nonprofit for the work you envision doing. While this book presumes you do in fact want to structure your organization as a nonprofit, it’s worth considering whether your goals may be better served with a for-profit business. When choosing between for-profit or nonprofit structure, there are some new hybrid business structures to be aware of. One such structure is the low-profit limited liability company, or L3C. An L3C is similar to a nonprofit in that its primary purpose must be to benefit the public. But an L3C is run and taxed like a regular profit-making business and is allowed to make a profit as a secondary goal. This type of business structure was born so that charitably oriented LLCs could receive seed money (specifically, “program-related investments,” or PRIs) from large nonprofit foundations, taking advantage of IRS rules that allow foundations to invest in businesses principally formed to advance a charitable purpose. Only a small number of states allow L3Cs, including Illinois, Kansas, Louisiana, Maine, Michigan, Rhode Island, Utah, Vermont, and Wyoming. It has also been adopted by the tribal governments of the Oglala Sioux Tribe, the Crow Indian Nation of Montana, and the territory of Puerto Rico. As of late 2018, there does not appear to be much momentum behind this structure, so it’s unclear what the future holds. In 2016, the IRS issued regulations for examples of investments that qualify as PRIs, and it notably declined to include L3Cs in the examples. This is likely to make foundations even more skittish to invest in L3Cs and puts the future of this structure in doubt. Stay tuned for future developments. organization dedicated to using the power of business as a force for good) at www.benefitcorp.net. A Certified B Corp, on the other hand, is a business that has been assessed and certified to meet sustainability-related criteria by B Lab. The corporation is run transparently, and must publish public annual reports on overall social and environmental performance against an independent and transparent third-party standard. If you live in a state that does not recognize benefit corporations, you can still seek to be certified as a Certified B Corp. B Lab tracks state legislative activity and adoptions at its Benefit Corp Information Center at www.benefitcorp.net. Finally, another corporate structure available to socially conscious entrepreneurs in some states, including California, Florida, Texas, and Washington, is the social purpose corporation (SPC). Like benefit corporations, SPCs hardwire their goals of positive social impact into their corporate structure, along with their goal to make a profit for shareholders. But while benefit corporations must pursue a more general public interest, SPCs have more flexibility in defining what their nonfinancial goals are and may pursue more limited public benefits such as job creation or environmental protection. Unlike shareholders of a benefit corporation, shareholders of an SPC do not have a special enforcement mechanism to ensure the SPC is pursuing its special purpose. The SPC’s impact on its special purpose does not need to be evaluated according to a third-party standard, and reporting requirements are less stringent than with benefit corporations. Like benefit corporations, SPCs do not receive tax-favored status. Whether or not you choose to incorporate, you may be eligible for another benefit as a nonprofit organization: tax-exempt status from the federal government. There are several types of federal tax-exempt status, but the most favorable is known as “501(c)(3)” status. This moniker refers to the specific section of the IRS tax code that not only exempts certain nonprofits from having to pay federal ­income taxes, but also makes contributions to these organizations tax deductible to the donor. Other ­sections of the federal tax code (such as 501(c)(4) or 501(c)(6)) also offer exemptions from income taxes for nonprofits, but do not allow donors to ­deduct their contributions. In this way, 501(c)(3) status confers especially favorable tax treatment to organizations that qualify: While many people give to their favorite causes just because they want to offer support, tax deductibility can be a crucial factor in attracting donations. As you can imagine, not just any old group can obtain 501(c)(3) tax treatment. Only groups created for specific exempt purposes—religious, charitable, scientific, educational, or literary purposes that benefit the public—are eligible. Groups that haven’t incorporated (often called “unincorporated associations”) can still be eligible for 501(c)(3) status as long as they meet all other requirements. Groups that don’t qualify for 501(c)(3) status might be eligible for other types of tax-exempt status—for example, social clubs are eligible under Section 501(c)(7), and trade associations are eligible under Section 501(c)(6). See the Organization Reference Chart in Chapter 1 for details. To obtain 501(c)(3) status, an organization must file an application with the IRS and be approved. The organization must submit documents with the application, such as its articles of incorporation and bylaws, which must show that the entity is, in fact, dedicated to one or more of the specific nonprofit purposes outlined above. In most states, a nonprofit that obtains an exemption from federal taxes automatically obtains an exemption from state taxes as well, so “tax exempt” generally means exempt from both federal and state taxes. Unless stated otherwise, throughout this book, the term tax exempt refers to federal tax ­exemption. The process of filing incorporation papers and applying for 501(c)(3) tax-exempt status is not covered in detail in this book. Another excellent Nolo title covers these topics in depth, How to Form a Nonprofit Corporation, by Anthony Mancuso. These processes aren’t incredibly difficult, but do involve enough details and subtleties that they really deserve a dedicated book. The book you are now reading is focused instead on helping readers gain a broader understanding of the many aspects involved in starting a nonprofit organization and getting it on the road to a sustainable and well-planned future. Many folks who are interested and active in community causes have a hard time transitioning to a more formal structure for their organization because they don’t understand many fundamental issues such as how nonprofits are structured; roles and responsibilities of the board versus staff positions; basics of strategic planning, budgeting and fundraising; etc. Just because you have a passion for stray animals, fighting pollution, or supporting our troops, it doesn’t necessarily follow that you have the first clue about how nonprofits are structured or how they operate. This book aims to give activists and community organizers the resources they need to transform their cause into a stable nonprofit with a healthy board and a solid foundation for growing staff. For a detailed discussion of the process of incorporating and applying for 501(c)(3) status, including step-by-step instructions for filling out the necessary forms, see How to Form a Nonprofit Corporation, by Anthony Mancuso (Nolo). Legal entity with one or more owners that has filed incorporation papers with the state. Owners (shareholders) of for-profit corpo­rations can reap corporate profits. Owners/directors are protected from personal liability. Legal entity with one or more directors that has filed incorpo­ration papers with the state. Directors of nonprofit corporations may not reap corporate profits; profits must stay in the nonprofit corporation. May obtain various types of federal and state tax-exempt status, including 501(c)(3) status. If tax exemptions are not ­obtained, profits are taxed as corporate ­income. Legal entity with one or more owners working toward a profit that has filed LLC papers with the state. Owners are protected from personal ­liability. and are taxed as personal income (unless the owners elect otherwise). Legal entity with two or more owners working toward a profit. Owners can be subject to personal liability. are taxed as personal income. Legal entity with one owner working toward a profit. Owner can be ­subject to personal liability. Many experienced business owners and managers are surprised to find that running a nonprofit is quite different from running a traditional profit-driven business. Assuming you’re an entrepreneurial type, you will probably figure things out quickly—but you should understand up front that running a nonprofit involves different approaches, judgments, and working styles than running a for-profit business. The legal distinction between a for-profit and a nonprofit corporation hinges on the purpose of the corporation’s existence: The purpose of a for-profit business is to earn a profit, while a nonprofit exists to further a mission in the public interest. Beyond this legal role, a nonprofit’s mission also drives many of the day-to-day operations of the nonprofit. Because a nonprofit’s purpose is to pursue a mission independent of any profit motive, success is measured differently than it is in a for-profit business. A business is considered a success if it makes a profit—and a failure if it doesn’t. A nonprofit, on the other hand, is judged by whether it is accomplishing its mission. As you can imagine, success or failure in these terms is not always easy to measure—you can’t come up with an answer by running a simple profit/loss analysis, for example. Of course, just because nonprofits are mission-­driven doesn’t mean they can ignore financial concerns. In reality, a nonprofit won’t be judged purely on how well it’s achieving its mission without figuring financial health into the equation. If a nonprofit has achieved success in pursuing its ­mission—say, in raising literacy rates in a particular city district—but has no money in the bank or financial prospects for the future, it can’t be called an unqualified success. Even though many nonprofits are supported by volunteer staff and may be quite adept at making the best use of scarce resources, no organization can run on fumes forever. Because almost every nonprofit faces a delicate balancing act between financing itself and achieving its mission, defining and measuring “success” in the nonprofit sector can be a challenge. For-profit businesses typically place a significant amount of decision-making authority in a few top-level positions—president, CEO, director, and so on—from which leaders may exercise control with little input or interference from others. Nonprofits, on the other hand, are required by law to have a board of directors that oversees operations; as a result, they are typically run in a more collaborative manner. Board members cannot make unilateral decisions but must vote as a board to approve or nix various proposals for action. If a nonprofit has an executive director, he or she is chosen by and accountable to the board and is not an autonomous decision maker like the head of a private company. For many people who are used to the relative free­dom of running a for-profit business, dealing with the collaborative management style of a nonprofit can pose a new challenge. Finding people to work for your nonprofit is likely to be one of the biggest challenges you’ll face—­particularly in the early days, when your entire organization will probably be on short rations. Many start-up nonprofits lack the resources they need to attract talented, experienced staff people who want to make a good living, which is often measured in competitive salaries and benefits. Another nearly inescapable reality of the non­profit sector is that there are never enough volunteers to do everything the nonprofit needs (or wants) to do. You may think that you won’t have trouble finding folks to help because your nonprofit mission is so important or you live in a progressive community where everyone likes to pitch in. Unfortunately, people lead incredibly busy lives these days and guard their free time jealously. Much of the volunteer work people do is for well-established organizations and causes with well-defined volunteer needs that can be carried out easily, with little direction. New nonprofits, on the other hand, rarely have needs that are so clear-cut—you may be figuring out your needs through trial and error, which can put too much responsibility on the casual volunteer. Finding volunteers and staff people is not impossible; you’ll just need to be ready for the unique challenges of finding and developing a nonprofit workforce. Nonprofit organizations don’t typically earn their money by selling products or services, like for-profit businesses do. Instead, nonprofits are supported by grants from public and private foundations, individual contributions, and/or membership fees. As compared to for-profit selling, nonprofit fundraising can be much more complicated and political. Nonprofit fundraising certainly requires marketing and sales skills, however. You must be able to convince potential funders that your nonprofit is the best or most compelling organization to which they can contribute their hard-earned dollars. If you hate selling and have convinced yourself that nonprofit fundraising will be different, think again. Fundraising can be difficult and time consuming; as a result, most nonprofits are perennially under­funded. Also, because a nonprofit is bound to a public interest mission and overseen by a board of directors, it doesn’t have as much flexibility—or as many options—as a for-profit business would when trying to get out of financial trouble or turn around a cash shortage. In short, nonprofit fundraising isn’t for everyone; it requires lots of energy, enthusiasm, and creativity—and the ability to work on a shoestring budget. rewards that many people find more compelling than the lure of financial gains in the for-profit world. For many socially minded entrepreneurs, starting a nonprofit is an ideal way to maintain a commitment to causes they care about while pursuing a career at the same time. This book describes the nonprofit organizational model that makes this possible and outlines all the steps and tasks involved in setting one up. 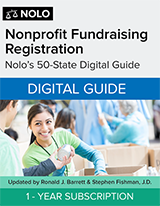 It explains all of the practical steps necessary to start and run a nonprofit, from ­deciding whether to form a nonprofit in the first place, to engaging in strategic planning, managing your finances and taxes, developing a website, and much more. The first chapter explains some of the choices you’ll have to face at the outset, such as what to call your nonprofit, whether to incorporate, and whether to apply for a tax exemption. Each subsequent chapter focuses on an issue you will face when launching your nonprofit, such as choosing a board of directors, recruiting and training staff and volunteers, fundraising, and marketing. At the end of each chapter, you’ll find a checklist that summarizes the key takeaway points, such as tasks for marketing your nonprofit. When you’re finished reading, you’ll have a clear understanding of what it takes to run a successful nonprofit, and you’ll be ready to pour your efforts into the important work ahead of you. Armed with the information in this book, you’ll be ready for the challenges—and rewards—that await you in the nonprofit sector.